How do I add/remove/re-order units in a custom assignment that I made? Once an assignment is created, you may need to make changes to the units in the assignment. To edit the units that are a part of an assignment: Click Edit. Note: Edits will not appear to any students that you have already assigned the instruction to. 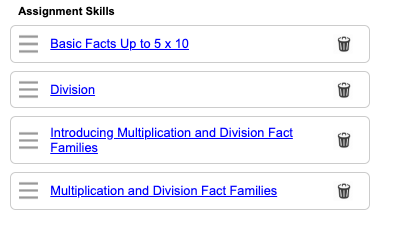 Use the grade level filter and/or search bar to find units that you would like to add to the assignment. Click the + sign to add it to your list of units. In the list of units for your assignment, just click the trash can icon to remove a student from your list. In the list of units for your assignment, you can change the order the students will work on them by dragging the handle icon to the left of the unit name and dropping it wherever you want. The drag and drop feature gives you the control to arrange units however you'd like. When done making any of these changes, click Create to save your changes.